Drift Falls is one of several waterfalls on North Carolina's beautiful Horsepasture River. 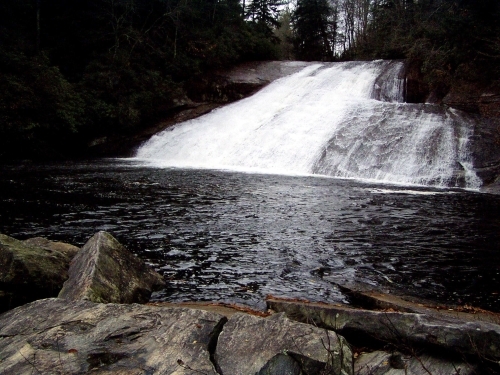 Other falls include Turtleback Falls and Rainbow Falls. A roundtrip hike to see all three falls is about 3.5 miles long. In the past, Drift Falls were often used for sliding into the cool waters of the river. 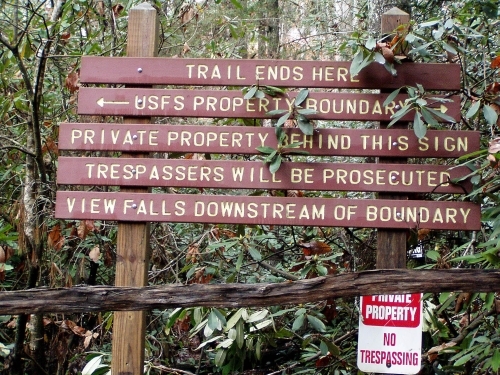 However, the land surrounding the falls are now private property. The sign below explains the trespassers face prosecution. Directions: From Sapphire, NC at the intersection of US 64 and NC 281, turn left onto NC 281 heading south. Drive one mile until you reach the entrance to Gorges State Park on the left. Park at the park, walk the park road back out to the highway, then walk south to a gated road about 50 yards below the park entrance. From the gate, walk about one-third mile to a split in the trail. Take the right fork for about .75 mile down to the river. Drift Falls is .25 miles upstream (please do not trespass at Drift Falls). Turtleback Falls is 200 yards downstream from where you reach the river. Rainbow Falls is another one-third mile downstream from Turtleback Falls.